When most people retire, they think about slowing down. Not Miss Ginny! Maybe it has something to do with the fact that she was born on the 4th of July which makes her a real fire cracker. She told her husband, Ben, that she wanted to open a bed and breakfast. Well, he thought she was crazy, but by then they had been married so many years he knew better than to ever tell her no. So, she started to look for the perfect house. Fate was on her side and she found a beautiful Victorian home right on the Laurel River in Damascus, Virginia. 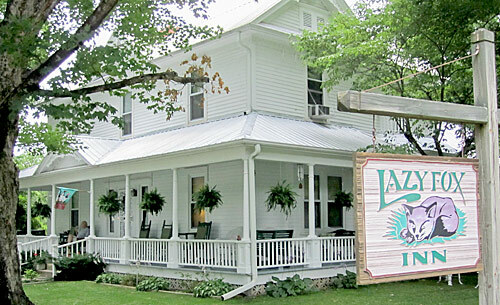 Of course, they had to spiff it up and opened The Lazy Fox Bed and Breakfast in 1991 when she was 67 years old. After 45 minutes in the claw foot bathtub, I almost felt human. Then, I introduced myself and took a nap. Yep, I was home. Damascus, Virginia has the reputation of being the friendliest town on the Appalachian Trail which is over 2100 miles long, and Miss Ginny’s breakfast is considered the best along the whole trail. There is no argument here! Picture 15-20 items to pick from, including the best cheese grits I have ever tasted, and this is from a northern gal who is not usually fond of grits. Then, when you roll yourself away from the table, you can hike, bike, sit by the river, or enjoy the wonderful wrap around porch. 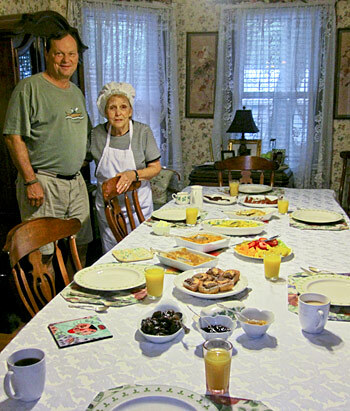 Below: Fifty Sense Co-Founder John Williams with Ginny and her fabulous breakfast. Miss Ginny lost her husband in 2004, and many thought she should sell the place because it would be too much. Ha! She let everyone know that she had to keep busy and running the B&B is what keeps her happy. 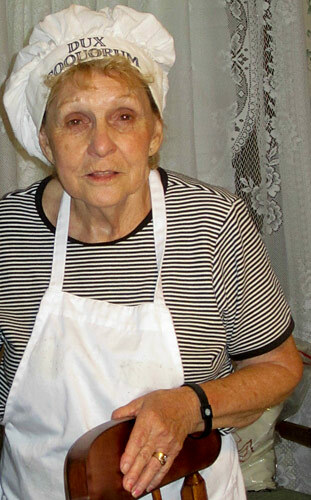 In the 20 years she has been running it she states that she has never had a mean guest or had anything stolen from her. She respects everyone and loves to meet people of diverse backgrounds and lifestyles. It is no surprise that if you want to stay there, make your reservations way ahead of time. It took me 10 years to get a room for Trail Days, and after 14 years of coming here, I will not give up my spot. This summer, John finally got to experience the Lazy Fox Inn hospitality and remarked on how he understands why I love coming to Damascus. I hope I can be like Miss Ginny when I grow up!